Are plant milks all the hype? Do they have enough nutrients, are they tasty enough to consume and are they environmentally responsible? We answer all these questions and more in our blog below. This week marked the 2nd annual “World Plant Milk Day,” on August 22nd, an initiative started by a handful of plant-based propponets and organizations such as Plant-Based News’s founder Robbie Lockie, and the international food awareness organization, Pro Veg. Partnering up with a multitude of restaurants and organizations, the founders of World Plant Milk Day took to social media and the streets this week to raise awareness of plant-milks health and environmental benefits, and encourage everyone to try out plant-milks rather than reaching for traditional dairy. If you haven’t noticed simply by browsing the grocery store aisles or visiting even mainstream coffee chains like Starbucks, plank-milk is everywhere. The worldwide move from traditional dairy to plant-based alternatives (not just milk, but also cheeses, yogurts, ice creams, coffee creamers, etc) is one of the fastest growing and most sweeping dietary trends on record. Just in the last 6 years, the market for plant-based milk has doubled. The sector as a whole is expected to reach $34 billion by the year 2024, which will mean it quadrupled from where it stood in 2014. As plant-milks climb in popularity, the sales of traditional dairy has been in something of a tailspin lately, and is slated to drop a whopping 11% by 2020 (and that’s on top of the 15% its already fallen since 2012.) This rise in plant-milk’s popularity with the accompanying decline in consumption of cow’s milk is attributed to the increased awareness of health drawbacks of drinking cow’s milk, and simultaneously, more and more healthy, nutrient-packed plant-based alternatives available at every major grocery store. No matter where you fall on spectrum of dietary styles, from omnivore, vegetarian, or vegan, plant- milk can have a place in your kitchen, and yes, even if you don’t suffer from lactose intolerance. The health and flavor perks are numerous, but to name a few, plant milks, unlike dairy, are cholesterol free, low in fat, and high in protein (sometimes even higher than traditional milk, in the case of pea or some soy milks). Many choose them because they also don’t contain the hormones, antibiotics, or other contaminates that traditional dairy has been receiving a bad rap for in recent years. Never tried plant-milk and not sure where to start? Though the options on grocery store shelves are numerous, especially as more and more options grace shelves just about every day it seems, don’t let the choices overwhelm you. 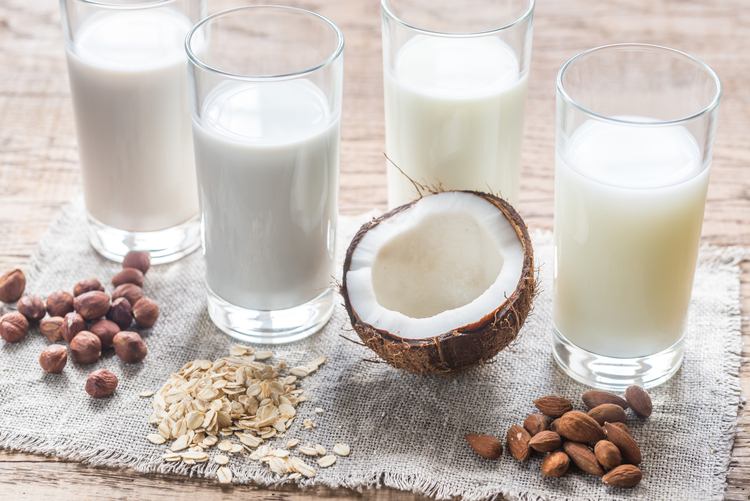 Traditionally, soy and almond have been the old standbys of the plant milk scene, but as demand and interest rises, alternatives such as milks made from oats, hazelnuts, macadamia nuts, and even pecans have been appearing on shelves. A good place to start is to first determine if your priority is a high protein milk, and if so, you’ll do well with choices like soy or pea milks. If you want a creamier, richer choice, but aren’t overly concerned with protein, cashew or coconut are both delicious. Many plant milks come in various flavor options like unsweetened, original, vanilla, or chocolate, so you can control how much sugar you’re getting per serving. Just take a quick glance of the nutrition label if you’re worried about nutrients such as Vitamin D and calcium, which many plant milks are fortified with. Plant milks can be used as an alternative for any time you’d normally reach for cow’ milk, such as a base for smoothies, chocolate milks, lattes, baked goods, or savory dishes. By steering clear of cholesterol and questionable additives, hormones, antibiotics, and lactose, which can affect digestion even if you’re not diagnosed as lactose intolerant, you may find yourself enjoying the health benefits as well as the taste more than you ever thought! Short vs Long workouts? Which is Better?